DirectShow can only be used in combination with the Microsoft Windows operating system. Since Windows Vista, Movie Maker does not support capturing from a device registered for DirectShow anymore. This is the documentation of the MATRIX VISION DirectShow_acquire interface. A MATRIX VISION specific property interface based on the IKsPropertySet has been added. All other features are related to standard DirectShow programming. The DirectShow_acquire supports the IKsPropertySet Interface. For further information please refer to the Microsoft DirectX 9.0 Programmer's Reference. The DirectShow_acquire logging procedure is equal to the logging of the MATRIX VISION products which uses mvIMPACT Acquire. The log output itself is based on XML. If you want more information about the logging please have a look at the Logging chapter of the respective "mvIMPACT Acquire API" manual. Please be sure to register the MV device for DirectShow with the right version of mvDeviceConfigure . I.e. if you have installed the 32 bit version of the VLC Media Player, Virtual Dub, etc., you have to register the MV device with the 32 bit version of mvDeviceConfigure ("C:\Program Files\MATRIX VISION\mvIMPACT Acquire\bin") ! If no device has been registered the application will more or less (depending on the installed devices) look like this. To register every installed device for DirectShow access click on the menu item "DirectShow" → "Register all devices". 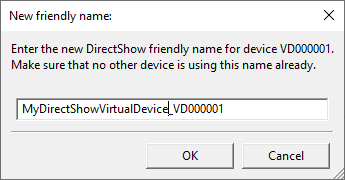 After a successful registration the column "registered for DirectShow" will display 'yes' for every device and the devices will be registered with a default DirectShow friendly name. If mvDeviceConfigure is already not running, please start it. Then, a dialog will appear. Please enter the new name and confirm it with "OK". Afterwards the column "DirectShow friendly name" will display the newly assigned friendly name. Please do not select the same friendly name for two different devices. In theory this is possible, however the mvDeviceConfigure GUI will not allow this to avoid confusion. To make a silent registration without dialogs, the Windows tool "regsvr32" via command line can be used. 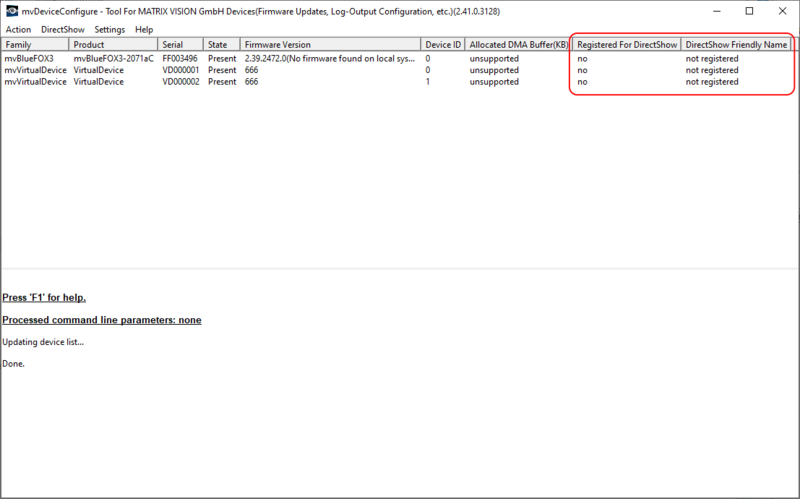 Register ALL devices that are recognized by mvIMPACT Acquire (this will only register devices which have drivers installed).